يعمل برنامج Destroy على حماية خصوصيتك على الانترنت من خلال منع مايكروسوفت من تتبع خطواتك على الانترنت، وتعقب المواقع التي تتصفحها. حيث يعمل البرنامج على حماية خصوصيتك من خلال تحسين اعدادات الخصوصية الخاصة بك من خلال واجهة البرنامج التي تمتاز بالسهولة في الاستخدام. تطبيق Destroy Windows 10 هو احد البرامج الهامة التي تهدف الى حل مشكلة الخصوصية على الانترنت. يمكنك تشغيل البرنامج على الاجهزة التي تعمل بنظام ويندوز 10 : Windows 7 and 8, either x86 or x64 - من خلال ضغطة زر يمكنك وقف جميع العمليات والبرامج والتطبيقات التي تعمل على تتبع انشطتك على الانترنت. Prevent Windows 10 from tracking your activity and improve your privacy settings due to this user-friendly and intuitive software solution. Even though Windows 10 did bring many of the features users expected of it, such as a Start Menu and revamped icons, it also came with several issues and a very important one is related to its tracking behavior. 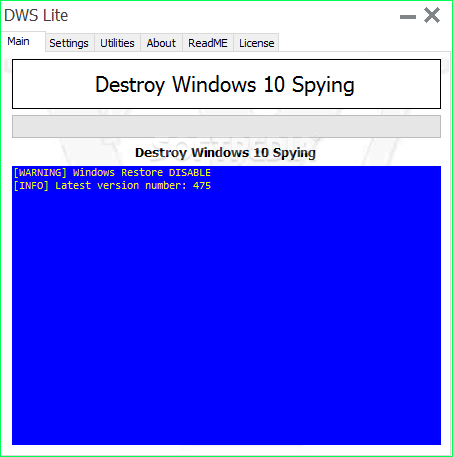 Destroy Windows 10 Spying is one of the many applications that aims to solve this problem. Despite its title, this portable application can be run on computers running Windows 10, but also on PCs running Windows 7 and 8, either x86 or x64. Once its main window is accessed, you can simply press a button and leave it to the app to stop all processes related to any activity tracking. It displays a log file that can be examined by all those who are interested in all the tasks it performs, but users do not have any control over these actions.